The .actor domain is a great option for entertainment-focused companies and individuals looking to stand out. In the entertainment industry, setting yourself apart from the crowd can mean the difference between success and failure. The .actor domain is a unique alternative to traditional .com websites. It can be used as a tool for networking and connecting with other like-minded people in your industry. The .actor domain was first made available in 2014. It’s a generic top-level domain that was created to be used by professionals and businesses in the world of movies, television, and stage production. However, it can be used by anyone who can benefit from what the domain has to offer. If you are a part of the entertainment industry, using a .actor domain is an easy choice. The memorable domain lets the world know that you’re a key player in the industry. Having the .actor extension tacked on the end of your web address makes you look professional. In a congested market, that added touch can make all the difference. Another reason why you might want to use a .actor domain is that it makes your website a lot easier to find. Potential clients or customers are going to use specific keywords when they’re searching for service in your industry. Chances are, one of those keywords is going to be “actor.” With a .actor domain, that keyword is built into your web address. Not only does this help with your search engine rankings, but it also attracts attention in a sea of traditional .com, .net, or .org websites. There are many great ways to use the .actor domain to your advantage. If you’re an actor, using this extension is a no-brainer. You can create a website to host your resume, videos of your past work, headshots, and contact information. You can then use the web address to stand out amongst other actors and actresses. A simple URL, such as YourName.actor, is more than enough to capture the attention of a casting professional or talent agency. Alternatively, you can market yourself based on your talents. For example, LocalArea.actor or Renaissance.actor could be used. The domain tells potential web visitors a lot about you and your website with just a glance. Many agents, acting schools, and production venues also utilize the .actor domain to attract attention. A talent agency could create a memorable URL like FiveStar.actor or Talent.actor to gain traffic. The possibilities are endless. Get creative and use some trusted domain hacking techniques to come up with an idea that benefits your needs. 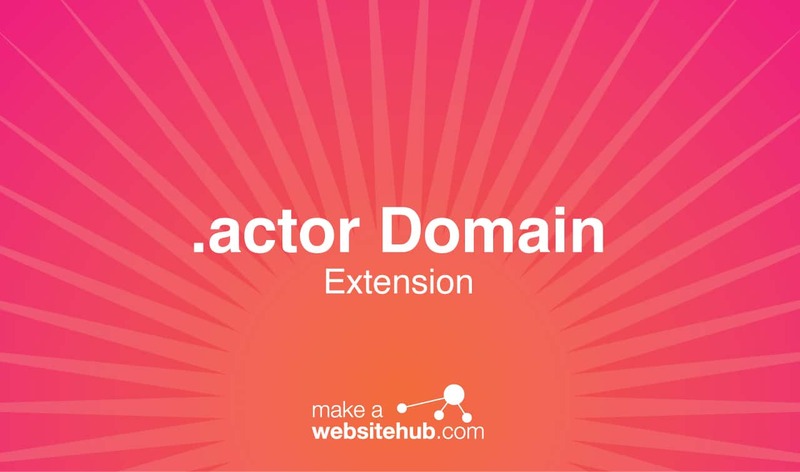 Where Can You Buy a .actor Domain Extension? You can register a .actor domain with most domain registrars. It’s offered by some of the most popular domain name companies around and can be registered for up to 10 years at a time. Here are some you might want to check out. Currently, there are no use restrictions with the .actor domain. Anyone can use it. However, that may change in the future. The registry operator, Demand Media, plans to implement some security measures to ensure that the domain is used for its intended purposes. Check with a registrar to see if your domain is available before these changes go into effect!